It's that time again - road racing is winding down, nights are drawing in sooner, weather's getting a little cooler and my legs start itching to get off the Tarmac. Dig out the knobblies, dust down last year's mud, kick off those uncomfortable road cleats, don the spd's (or the egg beaters), and bring on the Cross. 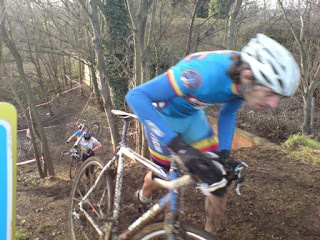 'Cos cyclo cross is back ! *******************“Everyone behind the line – I will set you off in the next 30 seconds” calls out the commissaire as he looks at his watch. The riders at the front jockey for position with their bikes on the front grid. They are held back by an imaginary gate that they will burst through on hearing the whistle. Other riders wait patiently, feet on pedals, ready to push off and begin their race. It may be cold, but the sun is out, as are many spectators. Some are carrying drinks, spare wheels, or even spare bikes. Some, keen to record the action have cameras. Others just want to cheer on their local heroes. To the onlooker this seems a very peculiar sight in the middle of the school playing field on a Sunday afternoon. But it’s nothing to get alarmed over. This is cyclo-cross. The whistle goes, and they’re off. The herd of cyclists charge off at full speed around the field, only to screech on the brakes after a few hundred metres in order to negotiate a steep drop-off - the first of various obstacles along the course. The stronger riders pull away at a ferocious pace and the field becomes strung out, as riders roll along at various speeds. As the race continues competitors will have to steer their way around many more obstacles, including sharp z-bends, planks, steep uphill banks, or even a sandpit. The spectators watch avidly as the lead rider completes the first lap of the muddy terrain. 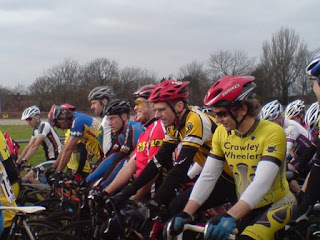 These were my first impressions when I first watched a cyclo cross race, and that was what started my interest in having a go. Sadly, I don't float along the field with any form of agility or skill, but I have lots of fun when I do a cyclo cross race. 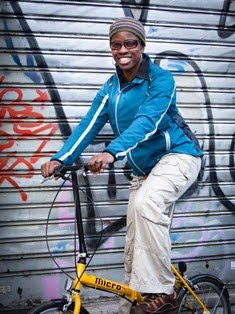 I have definitely improved since the first season that I did it, and it has helped my bike handling skills on the road. But most of all, it has kept me in trim during those cold sluggish months and it has helped to stave off any bouts of SAD. Bring on the Cross ! Hog Hill - What a Beast !! Fáilte go Phort Láirge* - from Sean Kelly !